The Chicago area woke up to rainfall Thursday, making the roads slick just ahead of the morning rush. NBC 5's Lisa Chavarria reports from StormChaser 5. The Chicago area woke up to steady rainfall Thursday morning. Rain covered the region as a foggy overnight turned into an overcast, chilly and windy morning. Rainfall will be moderate to heavy at times to start the day, making for wet road conditions just in time for the morning commute. 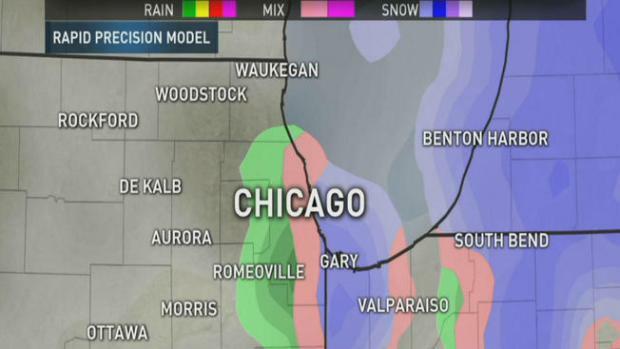 As colder air works into the system, the rainfall could briefly transition to a mix of rain and snow in Chicago before moving east. No accumulation is expected. The precipitation is likely to quickly move out of northwest Indiana early this afternoon before ending, leaving rainfall totals between 1/4 to 3/4 of an inch across the metro area. This additional rainfall may slow receding rivers or even cause them to rise a bit. Clouds will break for partial sun in the metro area, but it will remain windy and chilly with highs between 40 and 45 degrees. Most areas will remain dry and partly cloudy Thursday evening, though a few spotty showers are possible. Sunshine is expected to return Friday with cool conditions in the low to mid-40s. Temperatures will moderate through the weekend through the upper 40s to low 50s with sunshine and dry conditions both days. Portions of central Illinois and central Indiana will likely see dense fog Wednesday night. Natalie Martinez reports.